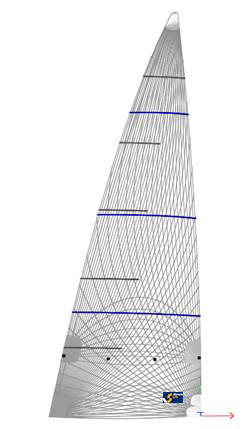 "Dear Paul, I now have the new sail on the boat and as suggested it has radically improved upwind performance. This has made the boat considerably more fun to sail! Thanks for your help. " 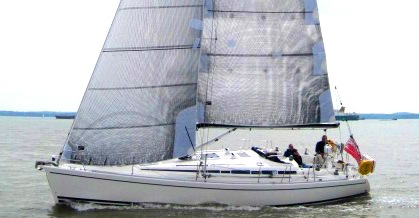 Glen Finegan Beneteau Sense 50 "Akaroa"
The main loads at work in a sail radiate out from the corners; with the highest stresses coming from the clew up to the head. 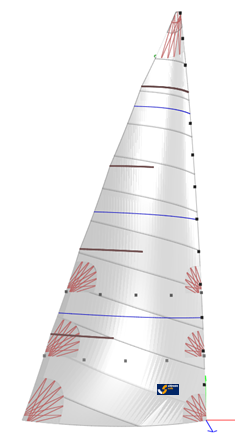 Our cross-cut Dacron sails feature a rocked panel design where the threads are lined up with the catenary loads to ensure that when the wind increases the sail will retain the optimum profile and increase drive. The cloth is aligned so that it sees the highest loads in the fill direction as this is where the weave is strongest. The downside of the cross cut layout that in some places the loads are running in the bias direction diagonal to the weave. (Try pulling at almost any cloth and feel how much more it stretches in this direction). 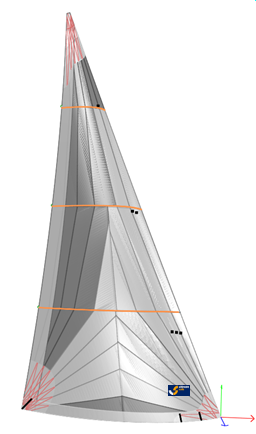 The next step up in sail construction is a Tri Radial panel layout. This gets around the problem of bias loading by cutting the panels so that the highest loads run in the direction of the weave. By combining this more efficient panel arrangement with advanced laminates the sail can be made stronger than a crosscut sail. This strength translates to better shape holding properties and ultimately better performance.